BioWear Liners are designed to minimize wear that occurs during transport of abrasive material in both shafted and shaftless screw ocnveyors. BioWear Liners are interchangeable with existing wear liners and can be provided in various thicknesses. The liners will be designed to match the existing screw conveyor securing system. The exact size of the liners required is to be provided to BioSec as sizes vary between screw conveyor manufacturers. The liners can be provided flat or preformed to size. BioWear Liners are designed for transporting abrasive materials and will provide three to four times the life expectancy of UHMW-PE, depending upon the operation of the equipment. Note: The capacities quoted above will vary depending upon the material to be conveyed, material dryness, and the speed of the conveyor. Dimensions are approximate. The listed capacities are an indication of performance of various vertical conveyors. The capacity depends on several factors, the main one being the product to be lifted. As a rule, vertical conveyors are not fitted with intermediate bearings. In circumstances where the material are to be transported over long vertical distances, it is recommended that staged vertical conveyors are employed. Vertical conveyors can be used on many different materials, including wet, sticky dewatered biosolids. 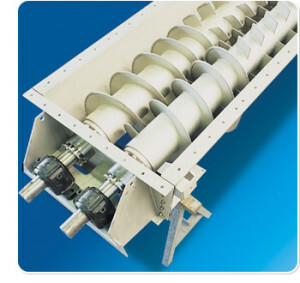 The compact design of the vertical screw conveyor has no return parts, like a belt conveyor. Therefore, one significant advantage is the limited size of the footprint. They can be installed into very tight spaces; typically with the drive able to be mounted at the top or the bottom of the conveyor.